Engagement for all. Employee engagement is becoming increasingly important in organizations and the workplace. Employee engagement, as I have stated numerous times, must be for the benefit of all. Employees must benefit and organizations and their customers must also benefit. Thank you Peter Hart. Before I begin the review I want to thank my friend Peter Hart of Rideau Recognition for recommending this exceptional book. You can read Peter’s blog by clicking here. In summary, recognition is key to motivation, to personal development, to positive relationships among people and to physical and mental health to work. It positively affects productivity and service quality, and it plays a significant role in the success and permanence of organizations. It gives meaning to a person’s work and value to what he or she does. Employee recognition is, in a way, an indispensable companion for an individual and an organization. Book Value: I encourage you to read this short yet informative and well-written and well-researched book. Each of the 7 pieces includes a questionnaire to diagnose your situation and a list of 10 practical actions you can carry out immediately. The final chapter offers the reader guidance on how to move from words to actions based on leveraging 6 levers of success and overcoming 5 obstacles. I appreciated the 2,000 working hours pinciple of asking yourself how many hours of work will be improved by an action you take. Get all the puzzle pieces. 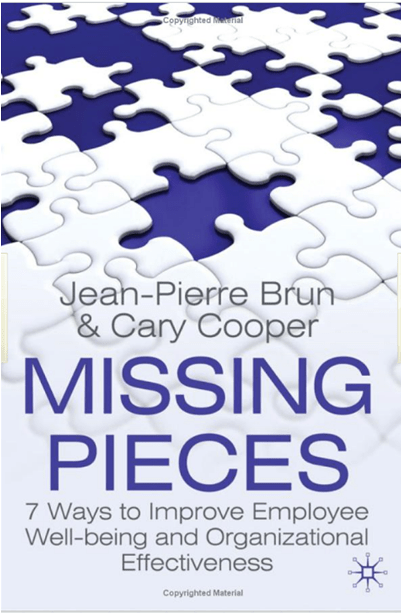 Don’t leave out any pieces that will leave you puzzled about weaving together employee well-being and organizational effectiveness, read Missing Pieces by Jean-Pierre Brun and Cary Cooper.